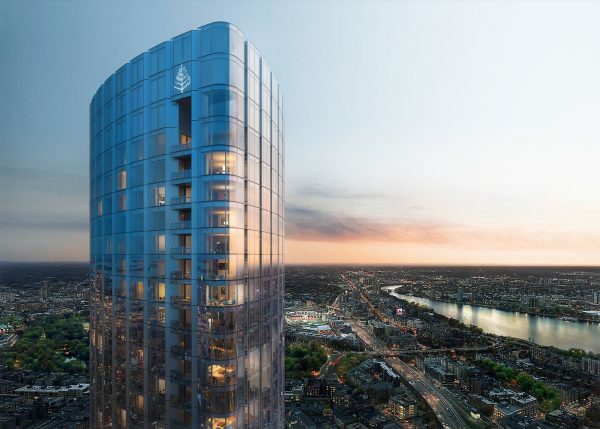 The Four Seasons Hotel & Private Residences at One Dalton Street in Boston, designed by our friends at Pei Cobb Freed & Partners, and which is slated to becomes that city’s tallest residential building, has topped out at 742′. Designed by Henry N. Cobb of that firm, in collaboration with CambridgeSeven, the 61-storey contains 160 residences, as well as a five-star hotel, and adjacent to it is a 5,000 SqFt park designed by our friends at Michael Van Valkenburgh Associates. Pei Cobb Freed, wanted a modern skyscraper “inspired by both Boston’s storied history as well as its progressive future.” The result is a triangular structure with bay window facades allowing for multidirectional views. The 160 residences are located at the tower’s highest floors to maximize views, and feature 11′ cove ceilings. A 215-key Four Seasons Hotel below will feature 20,K SqFt of amenity space accessible to residents. Under construction since 2015, the project is expected to be completed next year.